Agree or not, but iPhone is for sure one magnificent device! As you explore deep down in the settings tab of iPhone you will find some useful features that’ll enhance your experience. Well, one such hidden gem in iOS is “Display Accommodations” that manages the color filter settings of your device for an easy to eye reading. 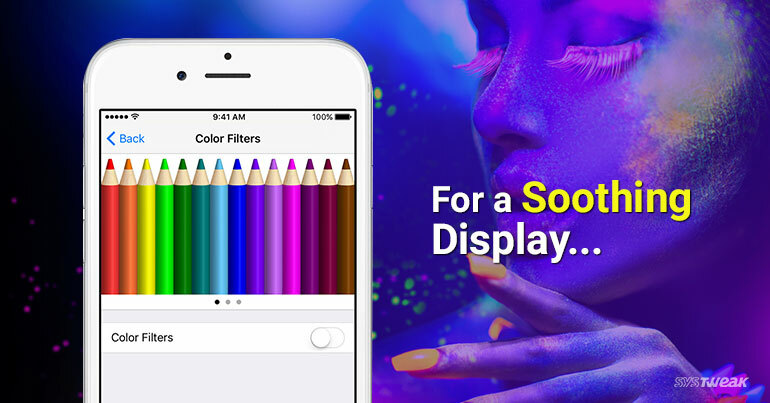 You can use the Display Accommodations feature on your iPhone and iPad, to transform the color filter levels on your screen, diminish the white brightness and vibrant colors on your screen. It even allows you to empower color filters specially intended to help individuals with color blindness. Let’s see how we can enable the color filters in iPhone/iPad for a soothing display! Here are the quick steps you need to follow to manage the color filter levels on your iOS device. Head on to Settings > General > Accessibility > Display Accommodations. Here you will find all the color-related settings of your iOS device. Firstly, you will see the “Invert colors” option on the screen. The invert colors option is basically used to make the iPhone display easier especially for nighttime reading. Once you toggle the switch the colors will automatically flip like the white will turn to black and black into white likewise. The second option that we saw on the Display Accommodation screen was “Color filters”. It allows you to enable different color filters designed particularly for people with color blindness. As soon as you tap on the “Color Filters” option, you’ll be headed on to a different screen. Enable the “Color Filters” slider here and select an option to see how your iPhone’s screen looks like. Lastly, comes the “Reduce White Point” option in display accommodation settings. The “Reduce White Point” makes white components and splendid colors appear dimmer. Once you toggle this feature you’ll get a slider which can reduce the intensity of bright colors”, and you can adjust it to your liking. This is a quite useful feature and helpful for people who face trouble reading the bright colors on device. Must Read: Tips and Tweaks to Improve Your iPhone’s Battery Life, Visibily! If you want to use these features occasionally, then it’s no big deal! But what if you want to access these features regularly? You surely won’t head back to settings and follow the same tedious process every time? Well, relax as we have a solution! You can add a custom shortcut to enable the display accommodation settings instantly. Here is how it works! Head to Settings > General > Accessibility > Accessibility Shortcut. Here you can pick any of the options for which you want to create a custom shortcut for easy access. Now once you triple-click the Home button, you’ll either see a menu of options (the ones you checked on the list) so that you can instantly access them right from the home page. P.S. Before proceeding these steps just make sure that the Guided Access feature of iPhone is disabled. To do so head to Settings > General > Accessibility > Guided Access and toggle the switch OFF. So fellas, did you know about this amazing hidden feature of your iPhone? If you know any such features then please feel free to comment as we love reading them.